Chelsea transfer: He's worse than when he first left! David Luiz has returned to Chelsea a worse player than when he left for Paris Saint-Germain two years ago, according to French journalist Julien Laurens. 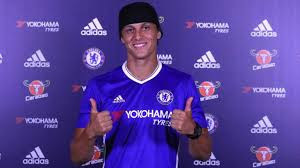 The Blues re-signed Luiz late on last night for £32million, having sold the Brazilian in the summer of 2014 to PSG for £50m - a world-record fee for a defender. Antonio Conte was desperate to recruit a new centre-half in the summer window and turned his attention to the 29-year-old after missing out on Napoli's Kalidou Koulibaly and AC Milan's Alessio Romagnoli. A Le Parisien journalist Laurens has slammed Luiz for his spell at PSG, suggesting the Ligue 1 champions couldn't believe their luck when Chelsea showed an interest. Laurens said: "He's been a liability for PSG more than anything else. Everybody remembers the game he had against Barcelona and Luis Suarez, who nutmegged him twice, in the Champions League quarter-final. "He humiliated him at the Parc des Princes and I think it's enough to say he hasn't improved at all since leaving Chelsea. "He's probably coming back a worse player than he was when he left." And when asked if PSG were happy to get the fee they did, Laurens added: "Well, yeah! They almost got their money back for a player who's two years older. "I've watched him pretty much every weekend since he joined PSG, I can hardly remember four games where he was actually good. He had some shockers. PSG couldn't believe their luck. "First of all they tried to keep him because they had no other option and then they though the money's too good, we can't turn that down, it's impossible."